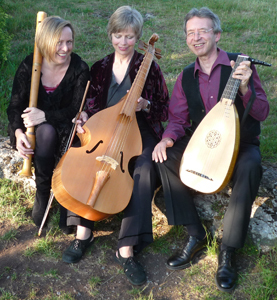 Three musicians with a passion for Early, Renaissance, Spanish, Moorish and Elizabethan Music came together in the summer of 2009 to form Rosafresca. Directed by Steve Walter, Bristol-based Rosafresca captures the excitement and spontaneity at the heart of the music whether Elizabethan love song or rhythmic Spanish dance. Rich textures and sonorities are recreated by period instruments – lute, vihuela, viola da gamba, recorders, cornamuse and a range of percussion. With a flexible line up drawing on the talents of guest singers, Rosafresca has appeal for concert-goers as well as enthusiasts of world and roots music. Please take a little time to explore this website, where you can learn more about the types of instruments that we play and the music that we recreate. You can even listen to our Sample Music, recorded at St Stephen’s Church, Bristol. Also, we would love to see you at one of Rosafresca’s Future Events.